Located a 1-minute walk from the Verdon River and 5 km from Castillon Lake, Ma petite Auberge offers a gourmet-style restaurant, a garden and a terrace. The heated rooms offer a flat-screen TV. The en suite bathroom is fitted with a bath or a shower and includes free toiletries. Some offer a view of the terrace and the village?s place. A continental breakfast is available every morning, and you can enjoy lunch and dinner in the park beside the 100-year-old Tilia Tree. Grocers can be found within 1 km. 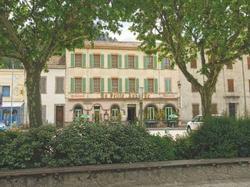 It is 40 km from Dignes Train Station and 15 km from Gorges du Verdon. A free, private car park is available on site. This heated room offers a LCD TV and free Wi-Fi access. The private bathroom includes free toiletries.